Partimus volunteers, lead by James Howard, have done a considerable amount of work at two public charter schools in Oakland, California, for the 2012 – 2013 school year. This blog post is the first of several that we will put up about this work. Since most of the work has been done by James Howard, most of the blog posts will focus on his work. We are truly grateful for all that James has done for these two schools. A little background into the work that James Howard has done at the ASCEND public charter school in Oakland. For several years, James Howard, the chief Partimus software architect and engineer, had set up and managed a GNU-Linux computer lab at the ASCEND school in Oakland. For this year, Robert Litt moved to the Prescott School in Oakland, and Francisco Nieto took over for him at ASCEND. On October 5, 2012, James Howard and several volunteers took two big carloads of machines donated by Dan Hernandez, the owner of Professional Computer Support, from San Francisco to Oakland, where some of the machines were dropped off at ASCEND and others at the Prescott School. Bryan Lafata at Professional computer support organized that donation on Dan’s behalf, as well as and others you will soon hear about. What follows is Francisco’s description of work for the first part of this school year in the lab. (His description has been slightly edited to correct typos and for context, but the essence is unchanged). Many thanks to James Howard for his great work at ASCEND and Prescott! And thanks to the volunteers who helped get the machines over to Prescott and Ascend in October, including Jim Stockford of Systemateka and Maestro! And many thanks again to Dan Hernandez and Bryan Lafata of Professiona computer support for the donation of the machines! (By Francisco Nieto): “James Howard had been working with Robert Litt, my predecessor at ASCEND for some time, so a lot of work, actually most, had already been done toward setting up our computer lab, such as setting up an install server and running ubuntu 10.04 on all machines. “When I arrived, I had to learn how to work with Linux from the ground up, and I had to learn how to manage a whole networked lab. James started working with me in September and has been helping regularly for the past couple of months providing indispensable support. “I had a bit of a wreck when I came in. Many of the Internet jacks were not live, many of the legacy machines I setu up did not take kindly to Ubuntu and there were constant headaches. James came and in and troubleshot them all, one by one, swapping hardware here and there, even using his own supplies and funds to get our lab going. He helped me change all my old hubs into new switches, and brought Lubuntu 12.04, which ran faster and leaner on all the old machines. He got the lab back up to speed in a few sessions. 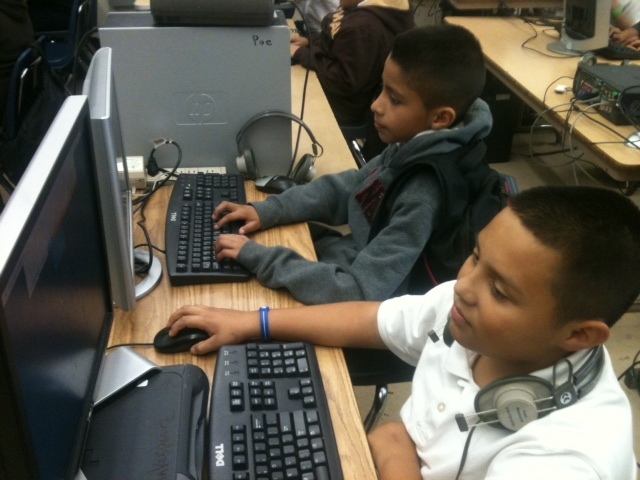 Kids enjoying multimedia in the Linux lab which James Howard created. “Then it came time to make some important upgrades, first and foremost, the addition of iTALC to manage all the users desktops remotely. Now I can screencast my screen to all the screens, lock screens of students who are browsing away from the assignment, send them text messages to remind them to stay on task, and remotely control all machines. The system is ocassionally a bit unstable, but it generally works and has made a huge difference in managing a bunch of middle schoolers as they surf the net. A bigger shot of the lab that James Howard built. “The partimus volunteers brought us a bunch of newer donations in October. These machines came in at the right time as many of the older ones couldn’t handle the upgrade to Lubuntu and had to be retired. “Overall, the quality of my teaching has been improved. Now I don’t have to spend the whole period troubleshooting recalcitrant machines and restarting them constantly, or replacing them with old macbooks, and I can send my time actually delivering tech instruction. This was written by Christian Einfeldt. Posted on Monday, January 28, 2013, at 3:11 am. Filed under News, Uncategorized. Tagged ASCEND, Bryan Lafata, Dan Hernandez, Francisco Nieto, James Howard, Jim Stockford, Prescott Elementary, Professional Computer Support, Robert Litt. Bookmark the permalink. Follow comments here with the RSS feed. Post a comment or leave a trackback. ‹ On “Giving Tuesday”, help us give to public schools!